Below is a recap of the parent/ player meeting tonight. You can go through the power point and read the slides, and below I will give the main points. The first day of practice is Wednesday August 1st. Equipment and locker handout is at 2:30pm!!! 1. Your athlete NEEDS a physical on file in order to practice on Wednesday. If your athlete did not have a physical after April 1st 2017 it is expired. If you don't know, email me and I will let you know if your athlete needs one or not. Even if you did it last year you need to update it each year. 4. Slide 6 shows the practice time schedule for the first 2 weeks. 5. I stressed that it is the players responsibility to communicate with the coach on scheduling issue, appointments, and general questions. I will always answer parent emails but I'd like players to take responsibility for getting answers to their questions as it is a skill they need as life progresses. My contact info is on Slide 7. 6. Hudl is the main way I communicate with the players. Please have them log into the app and turn on push notifications so they get updates. If they are having trouble have them email me, they can email me on here or school email. 7. We will lift on Mondays and Wednesdays in season for JV and Varsity--- we will lift during resource instead of at 6:00am like we used to. 8. All athletes need mouth guards, padded girdles, black and white half calf game socks. I have a few girdles for $30, mouth guards for $5. Have your son contact me if you need either of those. I will check sizes of girdles tomorrow at school. 9. Slide 12 has my lettering policy. 10. Slide 14 talks about playing time, earning playing time, and player communication if they think they should be getting more playing time or would like a better definition of their role on the team. 11. Slide 16 details our policy for missing practice. 12. Slide 19 talks about our gold card sale. Each player is asked to do their best to sell 20 of them. If your son did not receive his because he wasn't there tonight, have him contact me and I will get him his gold cards ASAP so he can start selling. This is the most important fundraiser we do each year! 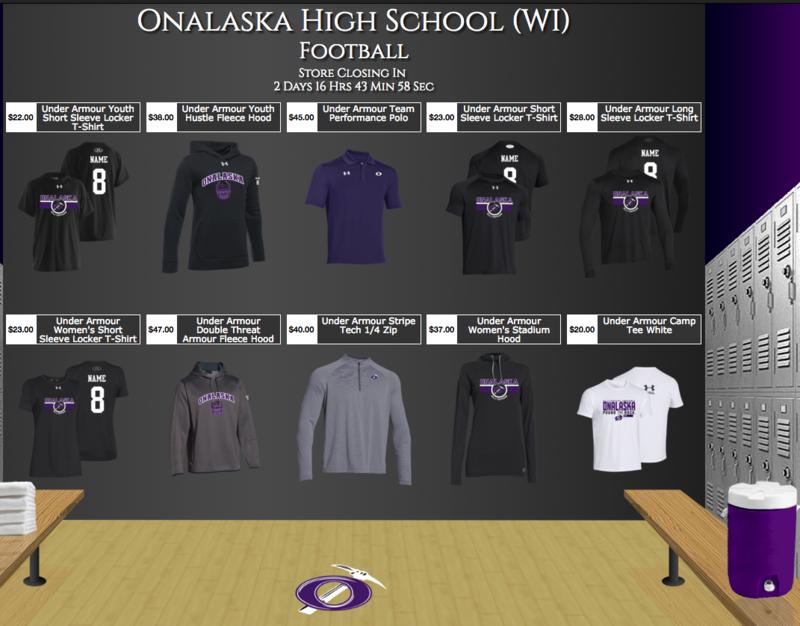 If someone wants to write a check have them write it to Onalaska Booster Club. 13. Apparel is in, I handed out most. I will hand out the rest on Wednesday unless you arrange to pick it up prior to then. There will be a different apparel order opening Friday through August 9th. We are only a few weeks away from football starting on August 1st so I want to update you on a few things. 1. Please get all physicals taken care of prior to August 1st as your athlete cannot practice without one. They need to have had a physical after April of 2017 in order to be eligible, and the physical needs to be on file with the activities office. You can get a physical at express care or many chiropractors for a low price if your doctor is full. Let me know if you need a contact for this. 2. There is a parent/player fall sports meeting on July 26th at 6:30pm in the PAC- we will hand out our fundraising gold cards at that time. 3. Reminder that we have practice the first Saturday (August 4th) along with our fundraising blitz that day. The following Saturday (August 11th) is our pancake breakfast for the mothers. Those are the only 2 weekend commitments of the season. 4. I will be out of the local area from this Saturday (July 14th- July 24th) for the high school all star game and a mini vacation with my wife. If your son needs anything from me for a camp or any other reason, they need to get it by Friday or wait until late July. 5. There is a O-line and D- Line camp at UWL this Sunday from 2-4pm. The cost is only $10 because we participate in the passing league there. Your son needs a helmet and shoulder pads from me if he is going to participate. He needs to get that tomorrow or Friday. Info for camp is at link below, but do not register because then it will cost $40, simply bring $10 on Sunday when you show up and they will have you sign forms there. If your son is going let me know so I can forward a head count to them. 6. We have 2 weeks left of summer strength training with the final thursday (July 26th) being our annual dodgeball tournament. If you work for a business that hands out corporate T shirts, or advertising gifts and would like to provide prizes for our winners, send them with your son and we will pass them out to the participants of our dodgeball tournament. 7. If you ordered apparel it will be in within a week I am guessing. It is 4 weeks from close of the order which probably got backed up a bit due to 4th of july holiday. There will be one last chance to order apparel in August, we open it so middle school has a chance to order as well. 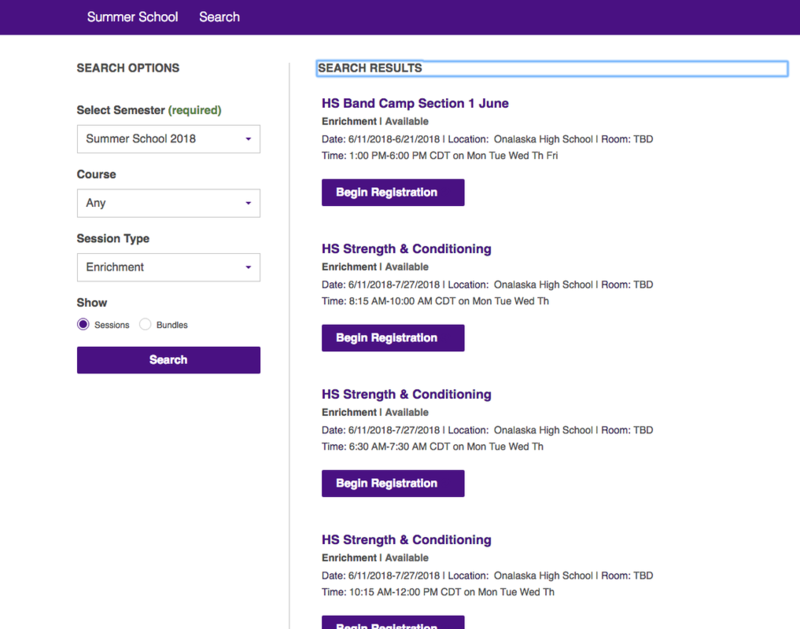 Summer School Strength and Conditioning sign up is open! Please get your athletes signed up. We have sessions for incoming 6th through 12th grade. This year we also have 2 boot camp style sessions that are 60 minutes long and are modeled after a Burn Bootcamp type training style hopefully to appeal more to our female athletes (anyone is welcome to sign up, it is not exclusive to females, but we are hoping that by offering this style we can increase female participation. Click link above to get to summer school page. Follow Directions in number 1 to create an account, remember you must use the email you have on file in powerschool and write down both the USERNAME and PASSWORD they give you. In upper right hand corner, log in using username and password given to you in step 2. Your browser should now look like the picture below. All Times are open to both males and females! 6:30-7:30am - Designed for athletes with open gyms, open ice, double summer school sessions, or other heavy intensive summer commitments. 8:15-10:00- Typically has been our older, more experienced athletes but will work with all athletes no matter ability level. 9:00-10:00- BOOT CAMP- High intensity training similar to "Burn Bootcamp." We have had requests from our female athletes to run a training session like this so we are offering two sessions this year. They are open to both guys and girls. 10:15-11:15 BOOT CAMP- 2nd session so that anyone who has first sessions summer school class can still attend. 10:15-Noon- Weight training and conditioning session like we have always run. Typically this session is our younger athletes and anyone who had first session summer school. 11:30-12:15- MIDDLE SCHOOL- intro to weight room and strength training for middle school. We use very light weights and teach form over putting heavy weight on. It ends at 12:15 so that students can go straight to our free lunch program in the cafeteria. This summer we will offer an early morning weight lifting option for those with double summer schools, sports that jam up schedules, or just want to lift early. We are looking at a 6:30am start time. Other times will be 8:15 and 10:15 with Middle School at 11:30. Menomonie High School is offering a 1 day Jeff Trickey QB camp on Sunday March 4th. Cost is $20. Contact me if interested. The WFCA Combine is April 21st at Sussex Hamilton High School. I highly recommend this for athletes who want to see where they stack up against others in their grade or those interested in playing college football. The cost is $60--- you DO NOT have to get the recruiting profile package that costs $125 and I don't recommend it for most. If you want to play college football, we will get your name out, don't pay recruiting services. See link below for more info. Sign up closes when the combine fill so if interested sign up quickly. Please check with spring coaches to ensure no conflicts! Our scrimmage has changed. We will be scrimmaging Eau Claire Memorial (@ Carson Park) and Marshfield. As we have become a better team and program it is time to scrimmage tougher competition as well. The scrimmage will be August 10th at 10:00am @ Carson Park in Eau Claire. If you have an interest in summer camps please let me know and I will give you some options. I think there are many great options within the state. If you are serious about college football I recommend the North Dakota State Camp in June. If your son is not currently in a sport please keep encouraging participation in our after school lifting at the high school. Success in football is determined in the off season in the weight room. It is essential that all of our out of sport athletes are in the weight room on a regular basis. The last 2 conference championships did not happen by accident, hard work is the key. Thank you and good luck to all of our athletes competing in winter sports as they get ready for the playoffs. This Sunday, December 3rd, at 6:00pm at Onalaska Middle School we will host our end of the year celebration. All grades are invited and encouraged to attend! We will be serving cake to celebrate as we recap our very successful season of football. There is no cost to attend and all family members are welcome. I choose to do cake instead of a full meal as I do not want anyone to have to pay anything to attend and want our celebration open to your entire family if they choose to attend. We will hand out a few team awards, recognize our all conference players, recap all three levels. As a way to get the community involved in our team we will have a guest speaker this year. Dave Skogen will be giving a speech on Leadership Principles. We also will be raffling off a few items. We will raffle off some apparel along with a helmet autographed by every member of the varsity squad. Raffle Tickets will be $1.00 for the apparel items and $5.00 for the helmet. All proceeds from the raffle go towards gifts for our 5 volunteer coaches, 2 managers, and 2 stat keepers. We will also have season highlight DVD's for sale for $10. Please email me if you'd like one so I can have it there for you that night. Thanks and I look forward to seeing you next Sunday night! Our apparel store has reopened for one week only. It closes on Sept 7th.